Tonight, Date Night takes in dinner and a show. After our meal, we are headed to the Fox Theater for “Million Dollar Quartet”, the show about a jam session in 1956 featuring Elvis, Jerry Lee Lewis, Johnny Cash and Carl Perkins. We’ll have more on the show later, but first, let’s eat! We are standing in Tap in Midtown it’s packed. There’s a convention in town and everyone in the room is holding a cold, craft beer. It’s a 30-minute wait for a table, and we have to be at the Fox in 90 minutes. That beer looks really good, but we don’t have enough time, so we leave, hoping to find a place that’s less crowded. Across the street, we spy a restaurant. In the heart of Colony Square sits Shout. Full disclosure: Because of the theater tickets, Date Night is on Thursday this week. We are joined tonight by the parents (and Date Night subscribers) Boots and Ken-Bob, who last joined us on Date Night #43 last September at La Paz. Ken-Bob knows the right people with the Here To Serve restaurant group, which owns Shout, along with Noche, Prime, Smash, Strip and Twist. Twist and Shout–get it? Very clever. He makes a call as we cross Peachtree, and we are “in”. Part of the huge space. 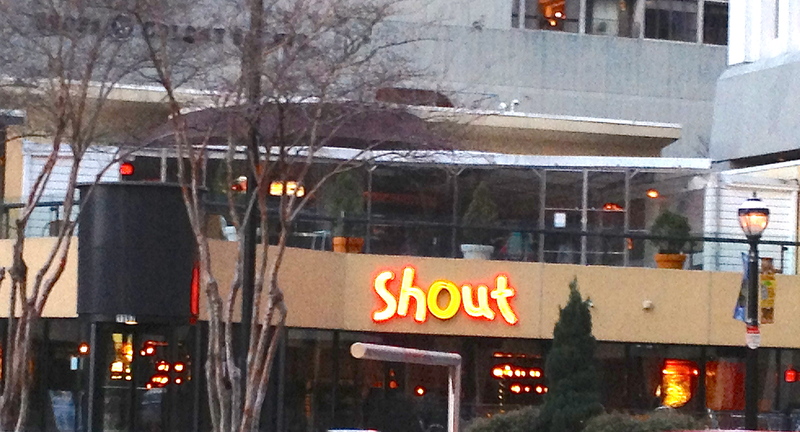 The menu at Shout is two-sided, with one side a good variety of pizza, sandwiches, apps, and entrees and the other side sushi. Still recovering from last week’s buffet at Caesar’s Palace, and because we are pressed for time, we decide to go light tonight and just share a couple of entrees. Eve orders the low country shrimp and grits. Low country goodness in the big city. This is an excellent dish, featuring shrimp with andouille sausage and some cheesy grits courtesy of lots of melted parmesan reggiano cheese. The sausage has a little kick to it, which gets cooled by the thick and creamy grits. There are only five shrimp on the plate, but there are plenty of the grits. 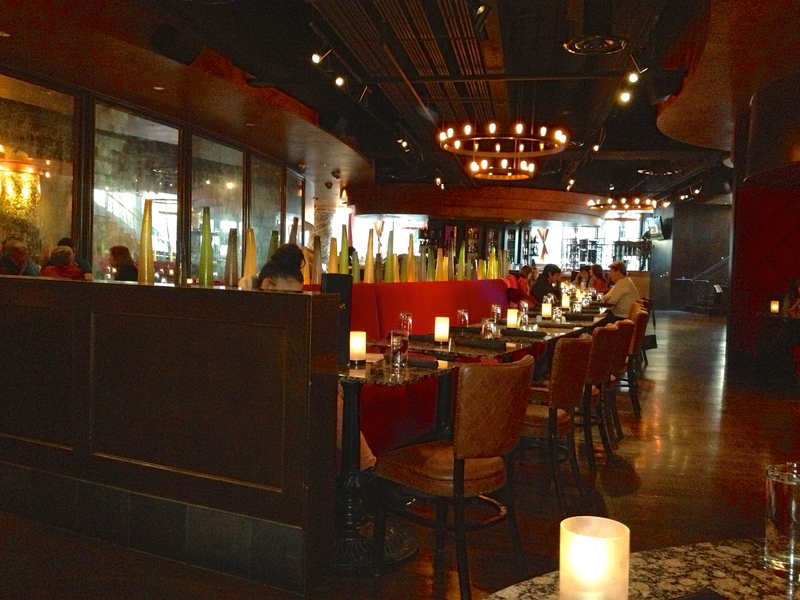 I order from the sushi side of the menu and try the Sinatra. Sinatra would have liked this dish. 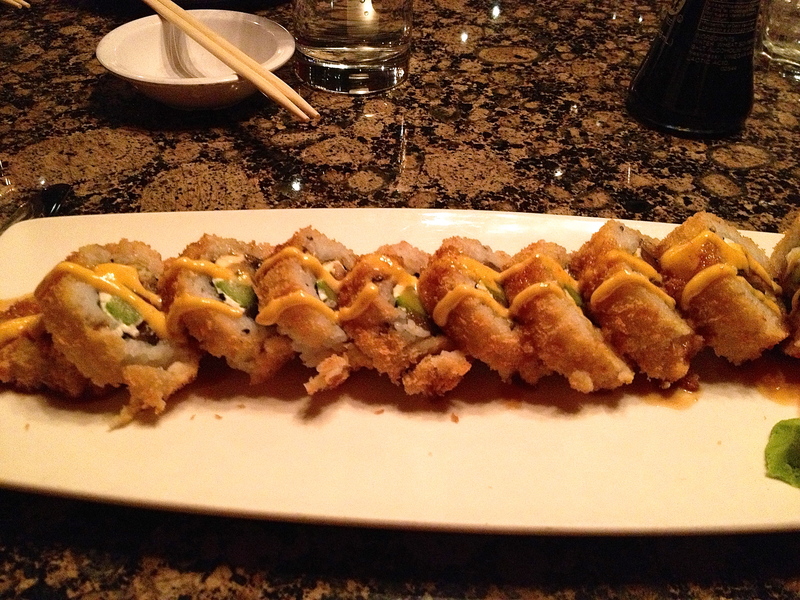 The Sinatra is a flash-fried roll of eel, yellowtail, tuna, cream cheese and asparagus. For $12, this is a “price performer” and a lot of food. It’s also very tasty. I am glad when Eve gives me back a piece of the roll after she eats her half because I do want more of it. Boots orders from the dinner side of the menu and gets a Cobb salad. 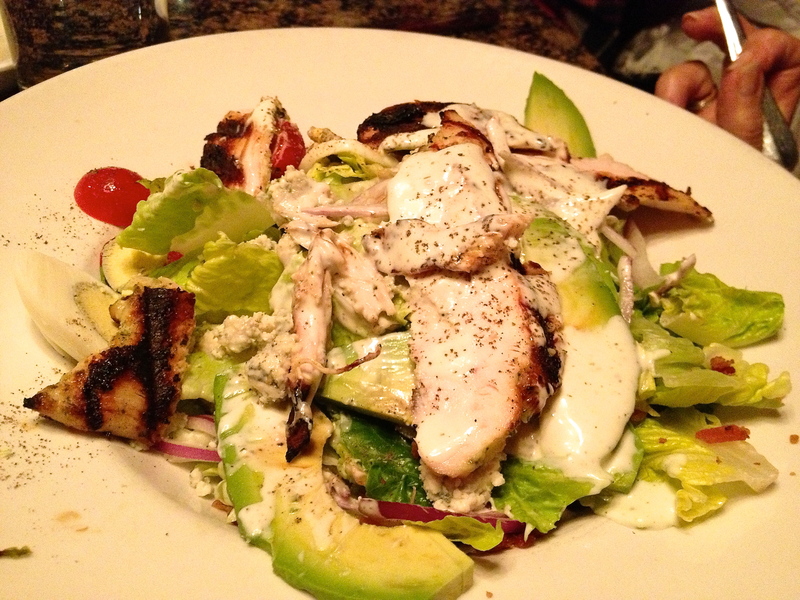 The Cobb salad was invented in Hollywood in the 1930’s. According to “the internets”, the Cobb salad was invented at the Brown Derby restaurant in the 1930’s. It is named after the Brown Derby’s owner at the time. The chef who devised the salad would be proud of this one. It’s full of grilled chicken and large pieces of avocado, one of which I steal from her plate. Ken-Bob gets adventurous on the sushi side. 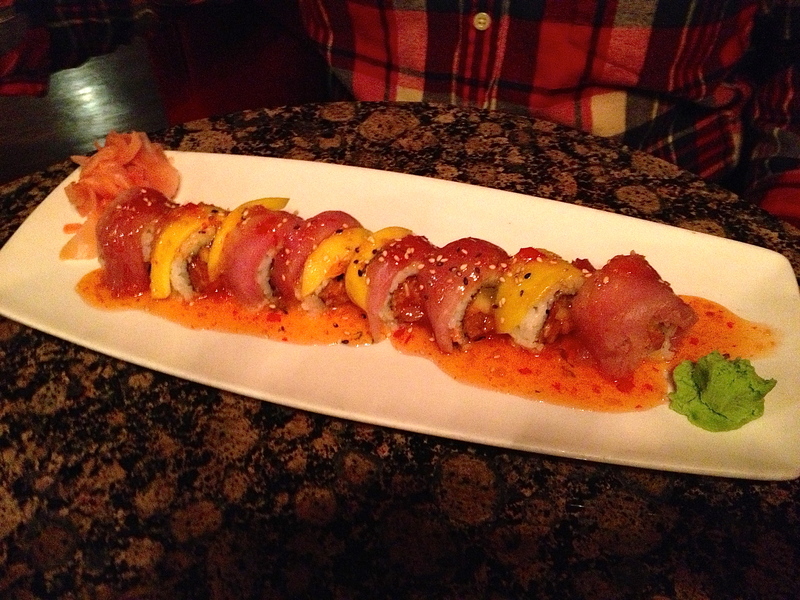 Meet the Hawaiian, a specialty roll of salmon, pineapple and yellowtail, covered with a sweet and sour chili sauce. This is also a lot of sushi for $12. It must be good, because he eats it all and doesn’t offer anyone a taste! 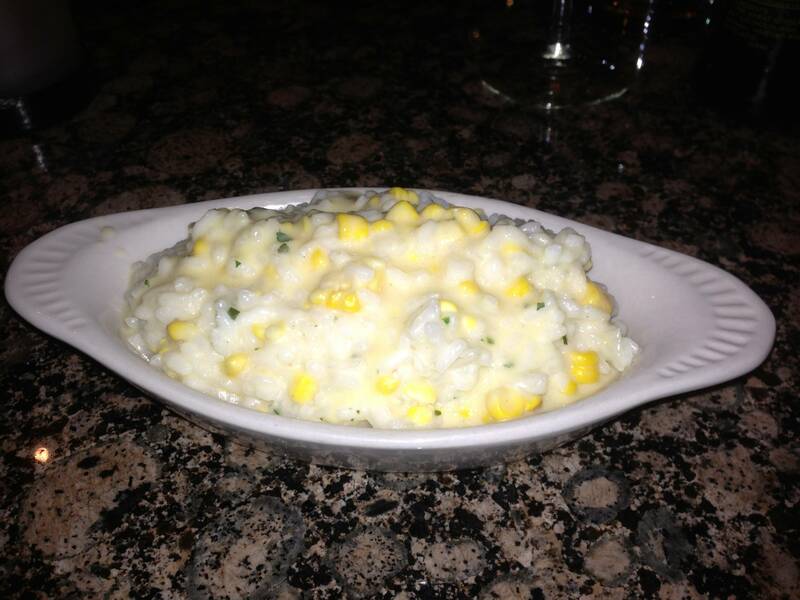 We also get an order of corn risotto for the table. 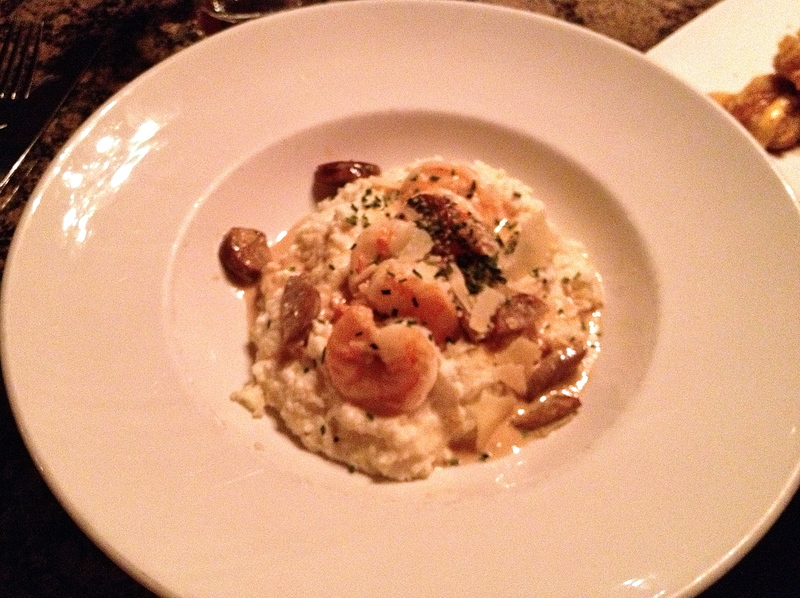 Like the grits, this dish is very creamy. I never think to put corn in my risotto, and I will try to cook this the next time I am making Italian rice. Unfortunately, the theatre beckons and we do not have time for dessert. While we are finishing up dinner, the executive chef comes over to say hello and we tell him how much we enjoyed our dinner. Date Night feels like a celebrity for the night.